Designed for year round cruising, Quantum of the Seas has many features to keep travelers entertained both outside and inside. 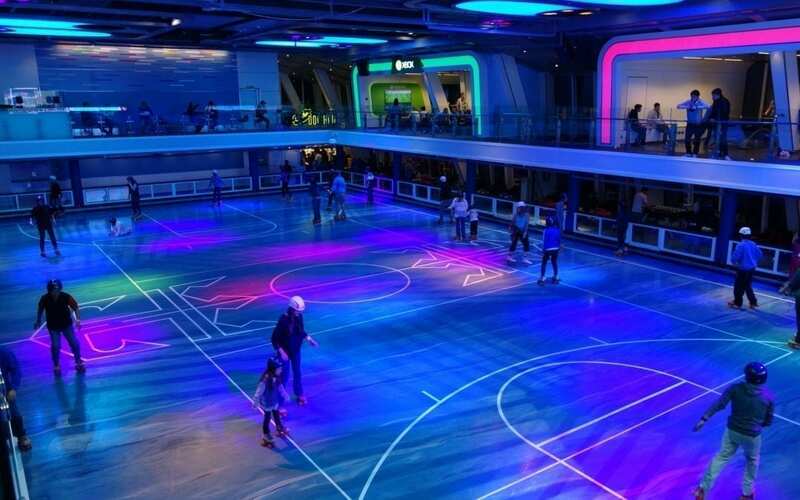 Besides the Flowrider surf simulator and a rock climbing wall, the sports deck on Quantum of the Seas mainly consists of a two story, multi-use indoor space known as the SeaPlex. 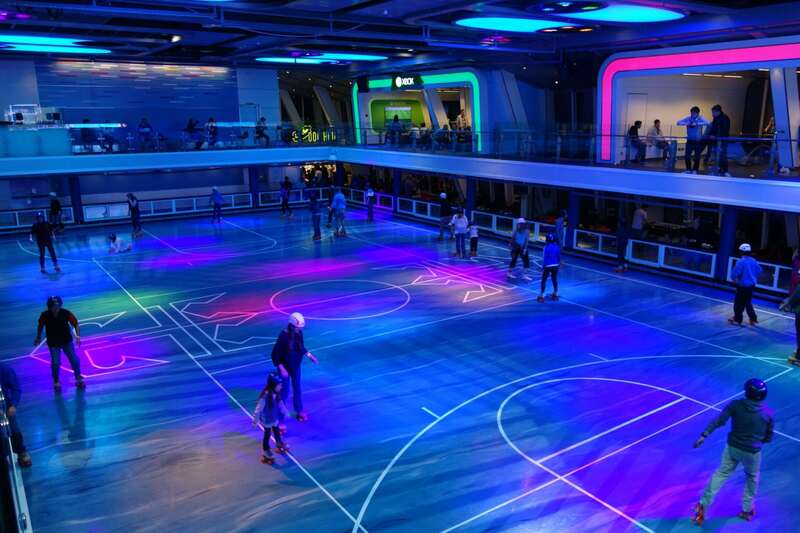 The largest indoor sports space at sea, the SeaPlex on Quantum of the Seas is home to a variety of activities and events throughout your cruise. Now, no matter what the weather is like outside, the SeaPlex is always available for a pick-up game of basketball, some ping pong or foosball, or even some bumper cars and rollerskating. After spending 8 days on Quantum of the Seas, we got to experience many of the exhilarating activities available, but even that was not enough time to do everything! One thing that you will notice from the outside of Quantum of the Seas is the size of the SeaPlex. Taking up most of the aft on decks 15 and 16, this two story structure covered in glass can not be missed, especially when you first pull up to the ship at Cape Liberty. The SeaPlex is open on most days from 8am to 11pm, even on port days, offering a variety of activities. 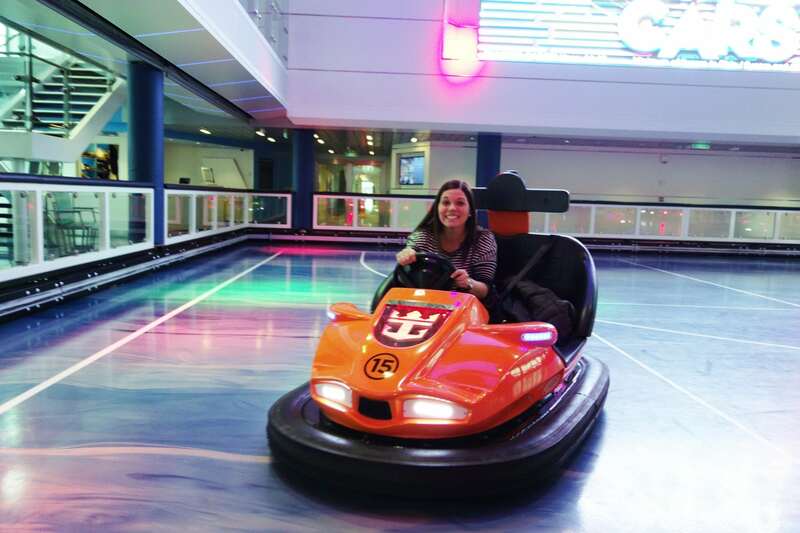 Right when you board, on embarkation day, the Bumper Cars are operating and ready for you to enjoy! We highly recommend you do the bumper cars on the first day. That is what we did, and it was so much fun! In fact, it was so empty that we actually rode them twice in a row. You are warned not to take pictures while you are actually driving your car, but perhaps we did not heed that warning! Lucky for us, the staff got much stricter with this policy as the cruise went on. These bumper cars are your typical 2-seater vehicle as children under a certain age need to be accompanied by a parent. But, that also means that if you have a carry-on bag, you should be able to put it next to you. The bumper cars do move pretty quickly, and the ride just seemed smoother than a typical amusement park attraction. It really does make you feel like a kid again as you race around the track, smashing into your fellow cruisers! Just be sure to wear your seat belt! Typically, the bumper cars were running during the mornings, with one evening time slot, during our overnight in San Juan. There were also a few select times reserved for specific groups, e.g. teens only bumper cars. So, always be sure to check your compass. When there were no other formal activities going on at the SeaPlex, the court was open for different sports including soccer, basketball, and volleyball. 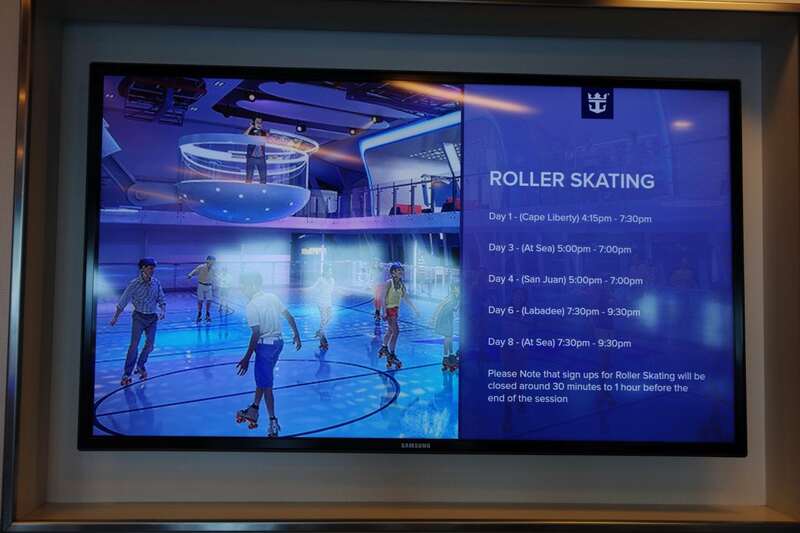 These open sessions are advertised in the Quantum of the Seas Compass, and if there is not a scheduled activity, you can assume that the court is open for these indoor sports. Honestly, we never participated in any of these sessions. When we did stroll by, mostly on our way to the Dog House, the courts were packed, mainly with teens. There were a few times we saw some adults playing basketball, but when the weather is not so great outside, you can expect the SeaPlex to be filled with kids taking advantage of the large playing area! If the waves from the Flowrider don’t wipe you out, then perhaps roller skating at the SeaPlex might be the thing that does! Running about every other day mostly during the late afternoons and evenings, the SeaPlex becomes a good old fashioned roller skating rink. Complete with neon lights and music, you’ll have a chance to strut your stuff, or make a fool of yourself, as you skate around this indoor rink. Not that I need any help embarrassing myself! When you find a roller skating time slot that works for you and your family, we recommend getting to the SeaPlex about 15 minutes early. For rollerskating, they hand out color coded wrist bands for each session, which lasts 20 minutes. There are only so many people that can be on the rink at one time, so getting there early ensures you get a slot for skating. Some of the sessions are themed, so check the compass for details. We went to the 70’s Disco roller skating session on Day 6. It was a riot, and since there were fewer skaters at this session, we got to skate for about 45 minutes! Double score! Beyond sports, the SeaPlex also contains a bunch of different game tables that are fun for the entire family. On the second floor of the SeaPlex, Royal Caribbean has stocked this loft with game tables galore. 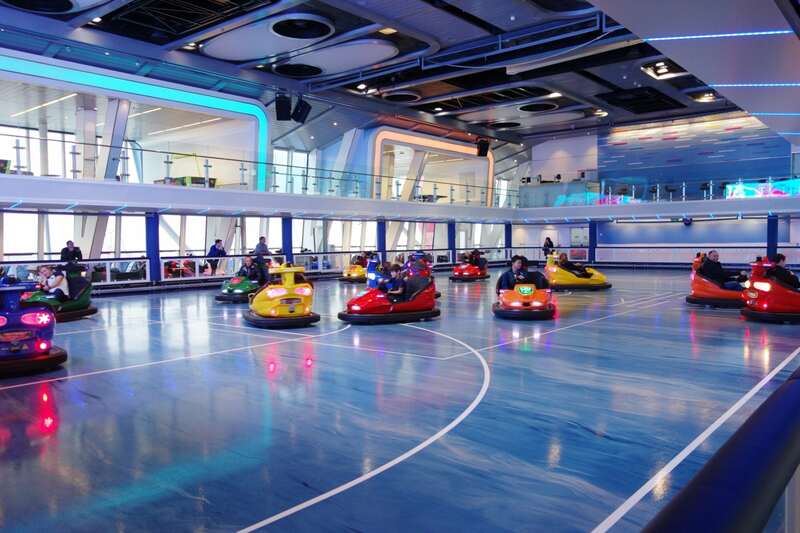 For free, cruisers can play ping pong and foosball; and for a small fee, which can be charged to your SeaPass card, players can engage in a friendly game of air hockey. Again, we did not try our hands at these games, even though The Princess does like her air hockey. I guess after her roller skating debacle, she did not want to face defeat for a second time! 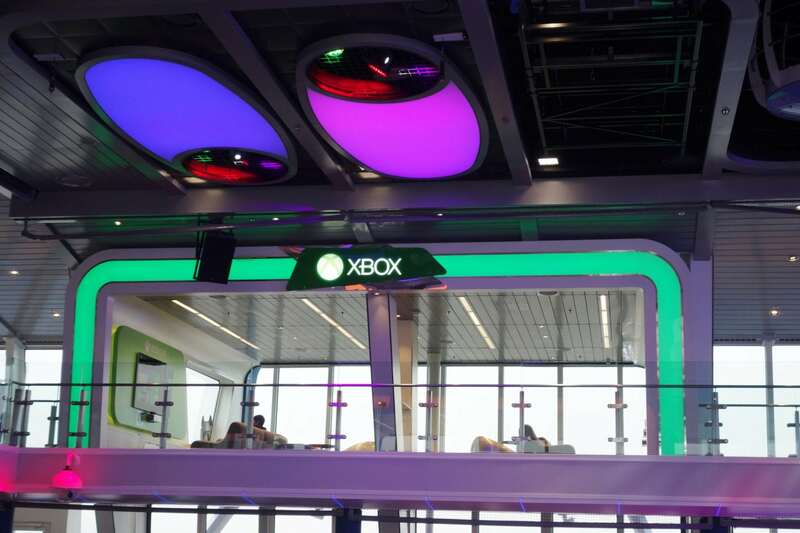 Lastly, the upstairs of the SeaPlex is also home to the Xbox Live Lounge. 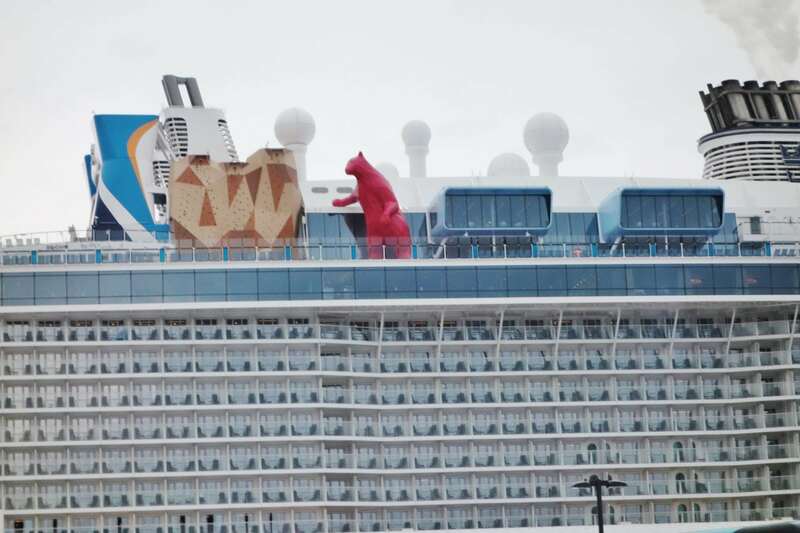 The first of its kind at sea, players can compete with fellow travelers or gamers around the world, through the use of the O3B satellite internet, on one of five units connected to flat screen, HD televisions. This area was always busy, and being a bit rusty on my video gaming skills, I did not dare challenge any of the teenagers that mobbed the lounge. Royal Caribbean advertised that the Quantum of the Seas would host a circus school, where travelers could learn how to fly on the trapeze or various other circus acts such as juggling. Unfortunately, during our cruise, the circus school at the SeaPlex was cancelled. We got no official response as to why, but we heard from others cruisers that it was due to a family emergency of the circus trainer. We will be sailing on Anthem of the Seas in January of 2016 and hope to give the circus school a test on that trip. 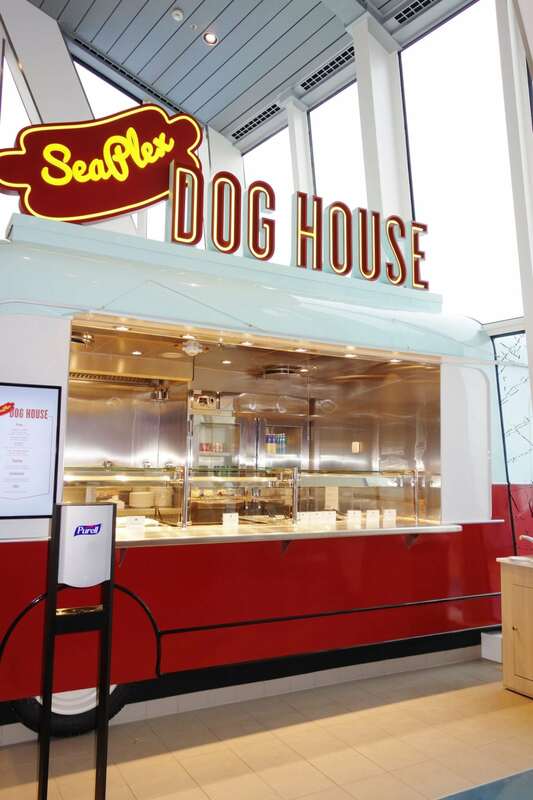 One of MY favorite things about the SeaPlex is that it is home to the first food truck at sea, the SeaPlex Dog House (see our complete review here). Located on the port side, completely aft, you can see the front of the truck sticking out of the SeaPlex building. After working up an appetite from all of the sports…or in our case, sport watching, you can enjoy one of four different dogs offered at this complimentary venue. My personal favorite was the Big Apple! 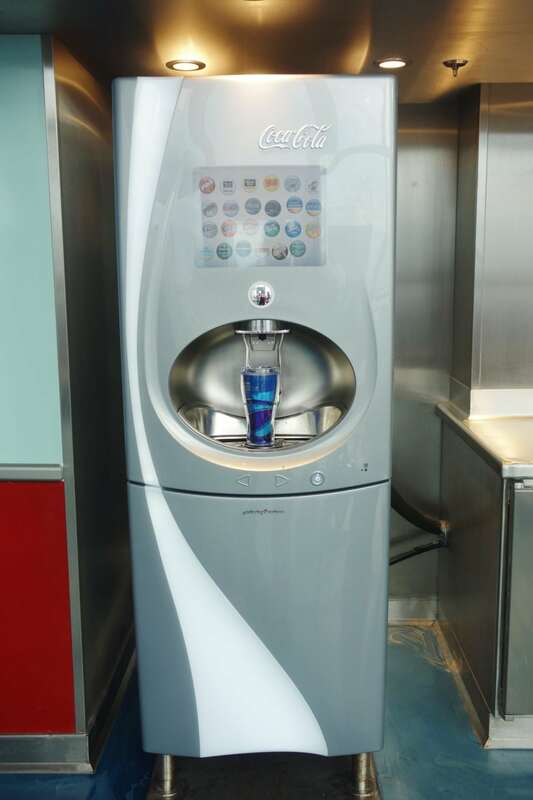 For those cruisers who have a beverage package, the Dog House also has a Coke Free Style machine! A definite thirst quencher, I regularly stopped here to fill up my beverage cup after a long day in the sun. The SeaPlex is a great space for travelers of all ages to hangout and engage in some friendly competitions. 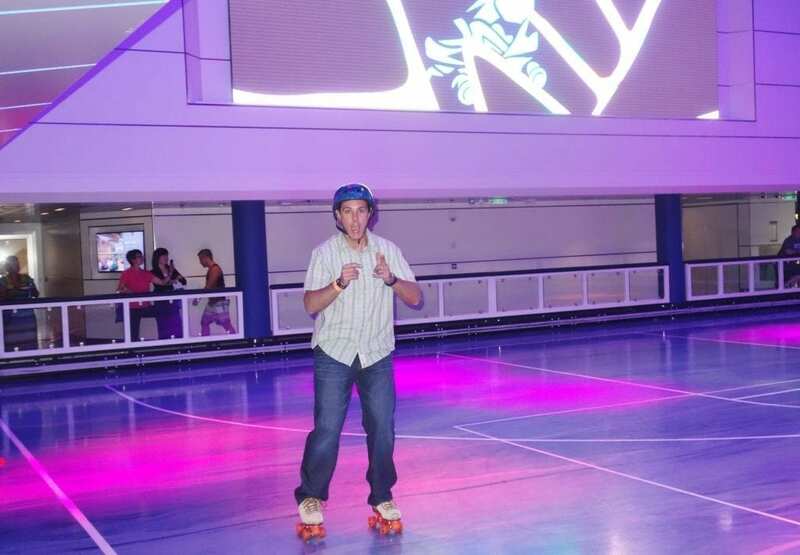 Whether it is sports, video games, table games, bumper cars, or roller skating, the SeaPlex gives you the opportunity to have some fun while making new friends. Even if you do not want to engage in any of these activities yourself, people watching at the SeaPlex is a great cruise pastime as well. Have you traveled on Quantum of the Seas and spent time in the SeaPlex? What are some of your favorite indoor spaces to spend time in during a cruise? Drop us a line below to let us know how you cruise when the seas are rough, and there is not much happening outside. Can anyone tell me the age/height requirements for the bumper cars? Lots of kids were turned away but staff didn’t know why. Thanks for the comment and question. So sorry that it took this long to get back to you. 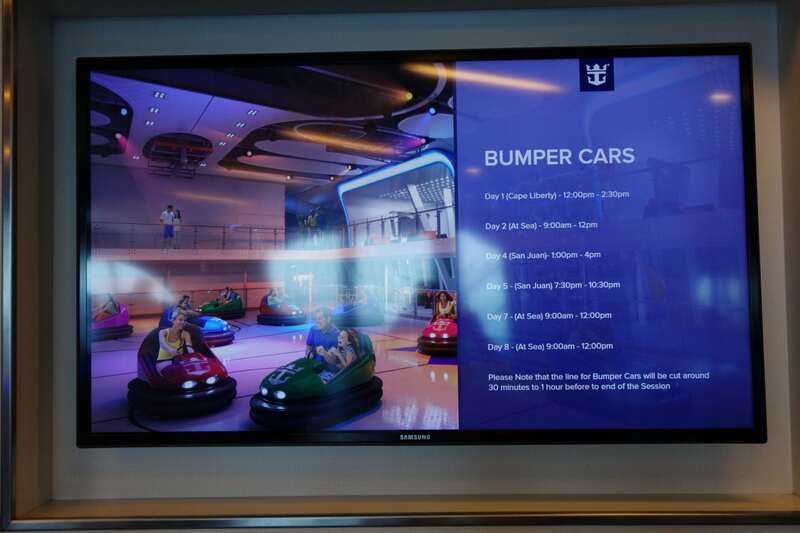 According to the rules and regulations we saw on the ship, children need to be at least 5 years old to ride alongside a parent, and at least 8 years old and over 42 inches to drive by themselves. We did not see anyone really ask younger kids who were accompanied by an adult their age; although, none of them looked younger than 5. They do have a stick to measure kids’ heights to ensure they are tall enough to drive alone. Hope this helps!